The founder of the New Orleans College Prep charter network qualified Wednesday morning to run for the open District 5 seat on the Orleans Parish School Board, and current school board member Woody Koppel also filed for re-election in his District 6. 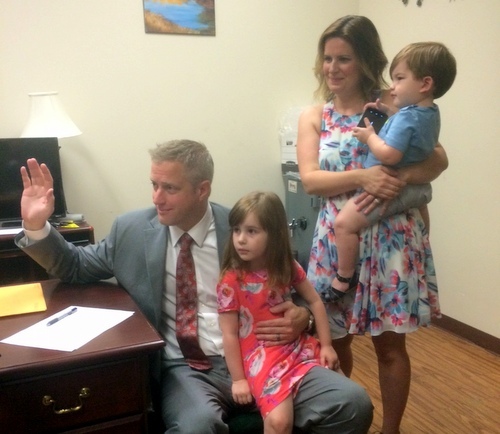 Ben Kleban became the first candidate Wednesday morning to file the paperwork for the District 5 school board seat that will be vacated by incumbent Seth Bloom’s decision not to seek-re-election. District 5 covers the downriver side of Uptown, as well as parts of downtown. “My vision for our New Orleans public schools is that every neighborhood will have an excellent public school that every parent wants to send his/her child to, regardless of demographics, income, or the special needs of the student,” Kleban said in a news release after qualifying. “We have to ensure a bright future for every child in New Orleans, and that starts with an affordable, high quality preschool that everyone can access. New Orleans College Prep received the charter for Sylvanie Williams Elementary School in 2009, followed by Walter L. Cohen High School in 2011 and then Lawrence Crocker Elementary in 2012, and now is expecting a total of more than 1,500 students this year across its Uptown campuses. Cohen has been the network’s most unambiguous success, rising from one of the lowest-rated failing schools in the city to a B school performance score last year and boasting a 100-percent college-acceptance rate for graduates three years in a row. Crocker has shown steady incremental improvement since joining the College Prep network, rising from an F to a C in the most recent letter grades. The performance score at Sylvanie Williams, the network’s first school, reached a high-water mark of a C in 2013, but fell back to a D the following year. Kleban has spent much of his career in New Orleans at the forefront of the charter movement. He was one of the first local school leaders to craft and describe publicly the framework for the return of Recovery School District schools to Orleans Parish control, and he has proposed a number of recent innovations such as tuition-based preschool at Sylvanie Williams and Crocker and scholarships to recruit high-school freshmen to Cohen. Prior to arriving in New Orleans, Kleban earned an MBA from Harvard Business School, completed his teacher-certification at the University of Pennsylvania, and taught high-school math in Philadelphia. Koppel’s re-election bid will be for a third term in his District 6 seat, which covers the Carrollton side of Uptown. He won his second term in 2012 with 66 percent of the vote. Wednesday is the first day in which candidates can file to run for the Orleans Parish School Board. Qualifying continues until 4:30 p.m. Friday, and the election is Nov. 8, with a runoff Dec. 10 if necessary.